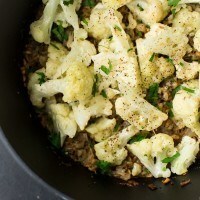 Baked Farro Risotto with Cauliflower | Naturally.Baked Farro Risotto with Cauliflower | Naturally. Heat a small, 3 quart dutch oven over medium heat. Add in olive oil followed by the minced shallots. Cook until shallots are fragrant and starting brown, 6 to 8 minutes. Add in minced garlic and cook for one more minute. Next, stir in the salt, pepper, thyme, and farro, Stir and let farro toast for a minute. Measure in vegetable broth, bring to a simmer, cover, and place the dutch oven in the oven. Cook for 20 minutes. After 20 minutes, remove from oven and add the cauliflower to the top of the pot. Cover, return to oven, and cook for another 10 minutes until cauliflower is just starting to softened. Remove from oven, set aside lid, and parmesan. Return the risotto to the oven, without the lid, and continue to cook for another 15 minutes or until the liquid has all been absorbed. Serve with an extra sprinkle of parmesan and fresh parsley if desired. Salt: I usually add the least amount of salt only because if you’re not using homemade broth, the salt levels can vary. Start with a 1/4 teaspoon and add more before serving if needed. Parmesan: As always, look for vegetarian friendly parmesan cheese (this is a good list of brands to look for). Dutch Oven: I’m currently using a dutch oven I purchased from Ikea but Lodge makes a really nice one as well. Recipe is adapted from this butternut squash version.